Elmeiz's Place Guest House in Accra, Ghana, is the latest offering in Ghana’s rapidly expanding hospitality industry. This unique property operates almost entirely on solar power, with only air-conditioning and other high consumption equipments on Ghana's Electricity grid, thus guaranteeing our guests 100% power at all times. Our family-owned and run guesthouse is nestled in the comfortable neighborhood of Dansoman in Accra, only a 20 minute drive from Kotoka International Airport. Elmeiz's Place is ideal for business travellers, returning Ghanaian visitors, Executive/Pastoral retreats associated with meetings, Honeymooners and regular tourists. We are located minutes away from the central business district of Accra, the local art and crafts market, as well as historical and cultural landmarks in the capital city of Ghana. Our guests will enjoy a beautifully designed rock garden and well-manicured property more typical of the cozy atmosphere of a quaint bed & breakfast with the services and amenities of a resort. 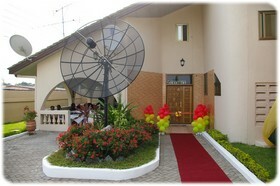 We hope you will make Elmeiz's Place Guest House your home on your next visit to Accra. Presently, Ghana's tourism is said to have the highest growth rate in Africa after South Africa and Namibia and it is the country's third largest foreign exchange earner after Gold and Cocoa. For more information on Ghana visit our Ghana Travel & Tourism page. When visting Accra, be sure to make it to Elmeiz's Place Guest House.